PXELINUX version 4.06 (2012-10-23) is included in the Tiny PXE Download. The most recent PXELINUX release at the time of writing is 6.03, however an older version has been included in the download as newer versions have issues when chainloading other Network Bootstrap Programs. libcom32.c32 "...can chainload MBRs, partition boot sectors, Windows bootloaders (ntldr, setupldr.bin and bootmgr), MS-DOS and PC-DOS io.sys, Freedos kernel.sys, isolinux.bin (only from ISOLINUX), grldr of grub4dos or a bootsector saved to a file. It can also swap BIOS drive numbers or hide partitions..."
libmenu.c32 "...HDT (for "Hardware Detection Tool") is a Syslinux com32 module designed to display low-level information for any x86 compatible system..."
mboot.c32 libcom32.c32 "...mboot.c32 is a Syslinux module that loads images using the Multiboot specification. A really good use case for this is booting Xen, or any other hypervisor-based virtualization pieces that also require an initrd/initramfs. If your Xen boot doesn't require an initrd, then it is possible to utilize the existing kernel/append method. Another use case for mboot.c32 is to boot FreeBSD ELF kernels with rootfs....."
menu.c32 libutil.c32 "...menu.c32 is a comboot module for Syslinux that renders a menu on the screen...."
reboot.c32 libcom32.c32 "...reboot.c32 is a COM32 module for Syslinux that is able to reboot the PC. It supports cold and warm rebooting....."
sanboot.c32 libcom32.c32 "...sanboot.c32 is a comboot module for gpxelinux.0 that enables gPXE's SAN booting options (iSCSI and AoE currently). This is only available in >=syslinux-3.71 for gpxelinux.0..."
libcom32.c32 Graphical version of menu.c32 (see above) - supports the use of .jpg wallpaper in boot menus. Note that vesamenu.c32 is not included in the Tiny PXE Server download. Please note that gpxelinux.0, a hybrid bootloader containing gPXE/iPXE, has been deprecated and replaced with lpxelinux.0 since PXELINUX version 5.10. MAC Address - lowercase hexadecimal with - separators. The MAC address needs to be preceded with its ARP type. E.g. for MAC address 08 00 27 7A 13 19 on a card with ARP type 1, use filename 01-08-00-27-7a-13-19. Clients IP (v4) address in a hexadecimal format. E.g. IP address 192.168.2.3 resolves to C0A80203 - therefore use filename C0A80203. Clients IP (v4) address in a hexadecimal format minus last digit from previous attempt. E.g. if C0A80203 was just attempted, try C0A8020, then try C0A802, etc. PXELINUX can be configured to display a menu when the Network Bootstrap Program pxelinux.0 is loaded. The SysLinux website lists a comprehensive range of options that can be used for a basic menu system. The Tiny PXE Server package includes a COM32 module for displaying a text based menu - menu.c32. It's possible to replace this with vesamenu.c32 if you want to add support for graphics - i.e. a splash screen. A quick note on the graphics mode supported in vesamenu.32 - the default is a resolution of 640x480 pixels. It's possible to change this using the MENU RESOLUTION command (e.g. "MENU RESOLUTION 1024 768") - if the selected resolution is not supported then a text mode menu will be displayed. Image files in .PNG, .JPG and LSS16 formats are supported. 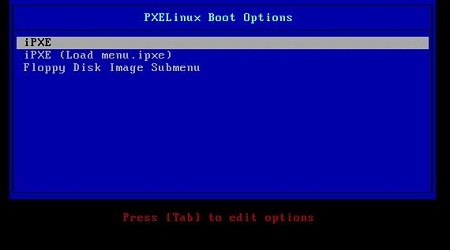 MENU TITLE - display a title ("PXELinux Boot Options" in the example above) for the menu/submenu. LABEL - this is a place marker - each menu entry should use a unique name in it's LABEL line. MENU LABEL - text that will be displayed on the screen for this menu entry. MENU LABEL statements do not have to be unique. KERNEL - the file to be loaded if the menu entry is selected. Supported files include linux kernel files, *.c32 modules, Network Boot Programs, etc. APPEND - parameter(s) to pass to the file loaded by the KERNEL statement in the same menu entry. The previous section lists some basic menu options - for more comprehensive range of settings refer to http://www.syslinux.org/.../menu.c32 and http://www.syslinux.org/.../SYSLINUX. "...The ^ symbol in a MENU LABEL statement defines a hotkey. The hotkey will be highlighted in the menu and will move the menu cursor immediately to that entry. Reusing hotkeys is disallowed, subsequent entries will not be highlighted, and will not work..."
"...If more than one label entry is available, this directive indicates how long to pause at the boot: prompt until booting automatically, in units of 1/10 s. The timeout is cancelled when any key is pressed, the assumption being the user will complete the command line. A timeout of zero will disable the timeout completely. The default is 0...."
"...(Only valid after a LABEL statement.) Indicates that this entry should be the default for the particular (sub)menu. See also the DEFAULT directive. If no default is specified, use the first one...."
"...(Only valid after a LABEL statement.) Specifies a help text that should be displayed when a particular selection is highlighted...."
"...Begin/end a submenu. The entries between MENU BEGIN and MENU END form a submenu, which is marked with a > mark on the right hand of the screen. Submenus inherit the properties of their parent menus, but can override them, and can thus have their own backgrounds, master passwords, titles, timeouts, messages and so forth. ...."